I imagine I'm not the only one knitting my way through Hurricane Sandy, but I do wonder how many other people might be spending their downtime knitting swatch after swatch without ever managing to get the right freaking gauge! I ordered myself some sale yarn for my birthday, brands I was not familiar with. When it arrived I was shocked to find that my "worsted" weight yarn was significantly finer than my "dk" yarn. Then, when I went to begin my swatches I realized the gauge for my worsted project was nearly identical to my dk project. 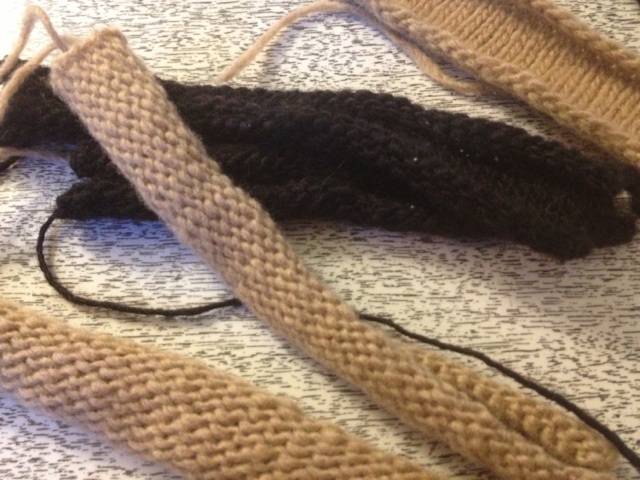 I guess this shouldn't be too much of a shocker; yarn weights are not all that standardized. That said I an incredibly frustrated that I cannot make my original dk weight project, because I just can't get it to gauge! So here I am now, 6 swatches in, and no projects begun. Wah!